One of the ways to help you sleep better and remember your dreams is to establish a healthy bedtime routine and make the space where you sleep as inviting and comfortable as possible. By creating a sacred space for dreams, you will find you sleep a whole lot better! This can help set the stage for being able to remember your dreams, as well as reduce the likelihood of nightmares. You will find when you make your bedroom a special place, you will feel better when you fall asleep and when you wake up in the morning. The space where you sleep should be a relaxing and safe environment where you are comfortable and is favorable for sleeping. 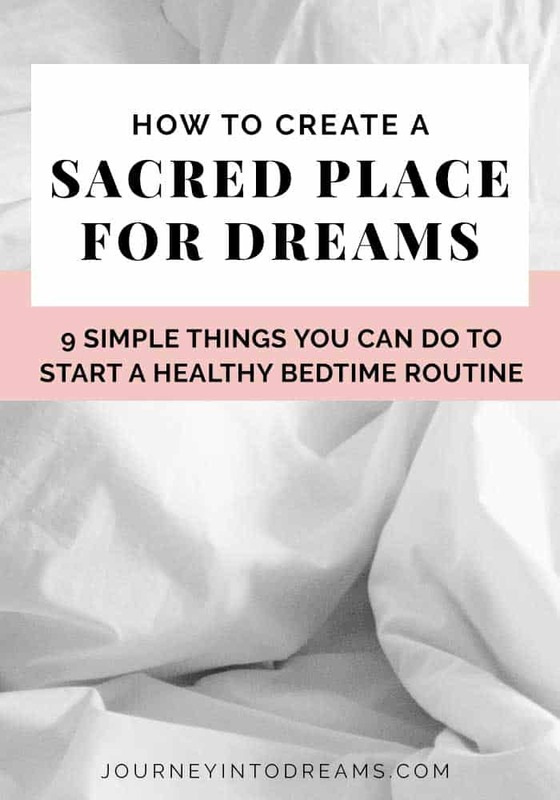 In this post, we'll share some tips to help you make your bedroom your very own sacred dream space. You don't have to do a lot of work in order to get your room ready for dreaming - often times these things are very easy to do or you may already have done some of these things in your room. These things are very easy to do and practical - so it's worth doing! Having a lot of things in a room can sometimes be distracting or cause you to feel subconscious anxiety about work that needs to be done. You will feel much more at ease if your room is neat and tidy. If you have a lot of things visible on shelves or scattered around, you may want to look into getting some simple baskets to organize. These affordable seagrass baskets on Amazon are a perfect example of how you can organize things in your bedroom while making it look nice at the same time! Your bed is where you spend over 1/3 of your life – so it might as well be comfortable! Choose sheets you love and pillows that are comfortable. Regularly clean the blankets and sheets so that when you lay down you feel fresh and relaxed. Make it a point to change out of your regular clothes into comfortable pajamas each night. This helps you train your brain that when you wear these clothes you are preparing for sleep. Plus, it will help you sleep better when you are comfortable! Lavender Satchets are a great way to add some relaxing scents to your bedroom! Click the image to learn more. This will of course depend on your personal preferences (and of course any allergies you may have) – but certain scents can help you feel more as ease and relaxed. For example, keeping a lavender scented satchet next to your bed may help you feel calm and relaxed and fall right to sleep. Lights can sometimes be disruptive to your sleep patterns. Try to reduce external light sources as much as possible. This will prevent you from waking up unnaturally and also give your brain the opportunity to truly rest. If you must have a light, consider investing in a small battery operated book light you can use in bed. You might also want to look into lamps that have settings to change the light brightness, such as this TaoTronics desk lamp - I have two of these and love them! It’s important that your room be the “just right” temperature for you. Ideally you would set the thermostat at 68 degrees and sleep great – but it is different for everyone. This is important because sometimes we get too hot or too cold while sleeping and it can disrupt our sleep patterns. While most experts will say to not watch TV at all before bed, many people I have met cannot really fall asleep easily without these things. It’s okay if you need to watch TV or listen to music in order to fall asleep. If this is the case, put the TV or radio on a timer so it turns off within 30 minutes, so that it does not stay on all night long and influence your sleep. An inexpensive grounded outlet timer makes it easy to just set it once and forget about it! Some people have a hard time staying asleep or find that silence can be difficult to fall asleep to. A fan or white noise machine can be very helpful in this situation so that it covers up any environmental noise without necessarily interfering with your sleep patterns. My favorite fan on the planet for sleeping is the Lasko Wind Machine Fan, although I know this is probably a bit extreme for most people. I love how it feels and it makes a decent amount of noise that I won't get woken up by outside noises like traffic on the street. It gives me the feeling of being at beach or by a lake and feeling a nice breeze. Doing these things to get a good night's sleep in your bedroom are not difficult and will give you a great space to sleep and prepare you for the best dream experience possible! Another important thing to do is to practice a nightly bedtime routine. Developing a bedtime routine can help you fall asleep easier as well as improve the quality of sleep you experience. Light acts as a stimuli for us to stay awake. By turning off overhead lights, turning lights off in rooms you are not in, and reducing lights from television or computer screens, it helps send a message to your brain that it is time to start preparing for sleep. This is one of the reasons I love the TaoTronics lamps - they let you easily adjust the light settings for a good night's sleep. Often times before we fall asleep we start replaying in our minds events from the day or worrying about what the next day will bring. Instead of worrying before falling asleep, try scheduling your “worry time” at a time earlier during the day. It might sound silly, but sometimes it can help you to get out of the habit of replaying all your worries in your head before falling asleep. Often times it can help you to know you have it on your schedule to worry about it the next day! Screen time is anything that involves electronics with screens. This might include playing video games, computer games, watching television, or checking your smart phone or tablet. And sadly, all of these things can all stimulate the brain, making it harder for you to fall asleep. Instead, opt for reading a book, journaling or writing, crossword or Suduko puzzles, or even try a meditative drawing practice such as Zentangle. Having a dedicated night time routine can also help you prepare for a good night’s sleep. For example, you might start by getting in your pajamas, having a cup of your favorite herbal tea, and then reading a light book before finally going to bed to fall asleep. Try to resist the urge to do activities while in bed - this can sometimes cause our brains to get confused about whether a bed is a place to be awake and working or if it is a place to feel relaxed and for rest! Your bedtime routine will vary depending on your own personal preferences - but making a regular practice of doing these types of things will definitely help you see an improvement in how you fall asleep and the quality of sleep you experience. Once your bedroom is prepared as a sacred place for dreaming, you are ready to start learning how to use your dreams in your life! Learning what dreams mean can have so many benefits to help you have a better understanding of yourself and help you get on the path of creating the kind of life you want to live. Do you have any thoughts or ideas about making your bedroom a great place to sleep? What are some of the bedtime routines you practice? Tell us how you prepare for a good night's sleep in the comments section below!